Moving furniture into or out of your home or business can not only be a pain, but it can also cause a pain. The fact is, if you try to move furniture on your own, you may end up with sprains, pulled muscles, or worse. Don’t take the risk! 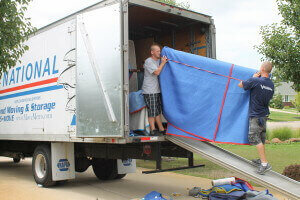 Instead, contact the furniture movers at All Around Moving & Storage for fast, reliable service. Our experts know what it takes to get even your heaviest furniture moved on your schedule, and we can relocate items of all sizes no matter where they’re located. Whether you need your sectional sofa moved to a new home, or you need your office furniture transported to a new commercial building, our furniture movers can handle it all. Using the latest in packing and moving supplies, our team provides extra protection for your furniture items, and we’re available when you need us. All Around Moving & Storage also handles antique furniture moving. We understand that you may have pieces that not only hold financial value, but also sentimental value, and many such items are irreplaceable. When you work with an antique furniture mover from All Around Moving &Storage, you’ll receive professional care from and expert who understands your concerns. We can move antique dressers, desks, tables, and more. Our goal is to get your antique furniture moved safely and efficiently at a great price. Our team can always find a solution to ensure that your items arrive intact. You can also rely on All Around Moving & Storage for convenient antique furniture storage and shipping. We have plenty of space to securely store any type of antique furniture items, and our logistics experts and warehousing professionals can create a customized shipment plan if you need to send your antique furniture to a new location. Contact All Around Moving & Storage for the best furniture moving company around. Whether you need local furniture movers or even an experienced antique furniture mover, call 734-941-2280 for a free quote.